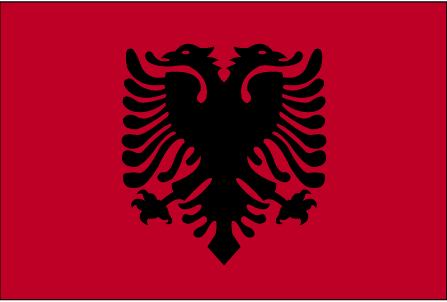 Albanians refer to themselves as Shqipetare, meaning “Sons of eagles”, and to their country as Shqiparia. Descended from the ancient Illyrians, they have lived in relative isolation and obscurity through most of their difficult history, in part because of the rugged terrain of their mountainous land, but also because of a complex of historical, cultural, and social factors. Owing to its location on the Adriatic Sea, Albania has long served as a bridgehead for various nations and empires seeking conquest abroad. In the 2nd century BC the Illyrians were conquered by the Romans, and from the end of the 4th century AD they were ruled by the Byzantines Empire. After suffering centuries of invasion by the Visigoths, Huns, Bulgarians, and Slavs, the Albanians were finally conquered by the Ottoman Turks in the 15th century. Turkish rule cut off Albania from Western civilization for more than four centuries, but in the late 19th century the country began to remove itself from Ottoman Orientalism and rediscover old affinities and common interests with the West. Albania was declared independent in 1912, but the following year the demarcation of the boundaries of the new country by the Great Powers of Europe assigned about half of its territory and people to neighboring states. Ruled as a monarchy between the world wars, Albania emerged from the violence of World War II as a communist state that fiercely protected its sovereignty and in which almost all aspects of life were controlled by the ruling party. Albania allied itself first with the USSR (until 1960), and then with China (to 1978). But with the collapse of other communist regimes in Eastern Europe in 1989, Albania, too, ended 46 years of xenophobic Communist rule and established a multiparty democracy in 1990. This shift reflected the country’s continuing orientation toward the West, and it accorded with the Albanian people’s long-standing appreciation of Western technology and cultural achievements even while retaining their own ethnic identity, cultural heritage, and individuality. Albanian is a language of the extensive Indo-European family and is thus related to a certain degree to almost all other languages of Europe. The Indo-European character of the language was first recognized in 1854 by the German linguist Franz Bopp (1791-1867). At the same time, Albanian shows no particularly close historical affinity to any other language or language group within the Indo-European family; it forms a language group of its own. Albanian is spoken by the inhabitants of Albania, Kosovo and Macedonia and Montenegro. There are approximately more than 300,000 speakers in isolated villages in southern Italy (Abruzzi, Molise, Basilicata, Puglia and Calabria), Sicily and Greece. The name Albanian has been found in records since the time of Ptolemy. 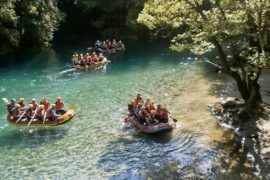 Albania has a reputation as a land of great natural beauty and romantic remoteness. These two characteristics have made it all the more attractive, mysterious, forbidding, challenging, or exasperating to outsiders, be they travelers, scholars, diplomats, or merchants. The remoteness and isolation of the country became practically legendary and all too frequently gave rise to reports and descriptions of the land and of the people even in books and encyclopedias that were closer to legends than to reality. Perhaps because of its romantic remoteness and other reasons, Albania has exerted a continuous fascination on artists, including poets, playwrights, composers, and more recently filmmakers and producers of television programs. Shakespeare set his comedy Twelfth Night in Illyria, the name by which Albania was known in former times. Albanian food has been strongly influenced by Turkish, Greek and Italian food. Grilled meats like shishqebap (Shish Kebab), romsteak (minced meat patties) and qofte (meat balls) are common dishes. Popular local dishes are comlek (meat and onion stew), fergese (a rich beef stew), rosto me salce kosi (roast beef with sour cream) and tave kosi (mutton with yoghurt). Lunch is the main meal, although eating out in the evening is increasingly common everywhere. Akullore (Ice cream) is very popular, and the coffee is either kafe turke (Turkish coffee) or kafe ekspres (espresso). 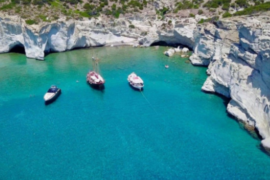 The white wine is usually better than the vinegary red, and other local drops are raki (brandy), Konjak (cognac), uzo (an aniseed flavored liqueur like Greek ouzo) and various fruit liqueurs. Burek is also very common. It is an often greasy, cheese or spinach and sometimes meat-filled filo-dough pastry. It is eaten at any time of the day. The best month to visit Albania is September, when it is still warm, the days are long and the fruit and vegetables are in good supply. The sun shines longest from May to September, and July is the warmest month, but even April and October can be pleasant. Like other Mediterranean countries, Albania has characteristically warm, dry summers and mild, wet winters. Local climatic variation is considerable, however, from one region to another. The western part has more moderate temperature than the rest of the country. For example, Saranda, on the southern coast, has average daily temperatures of 75° F (24°C) in July and 48° F (9° C) in January. The eastern part of the country, on the other hand, is characterized by mild summers (owing to the high elevation) and cold winters. Peshkopi, in the eastern mountains, averages 75° F (23° C) in July and 30° F (-1° C) in January. Rainfall in Albania is abundant, but it occurs unevenly throughout the year. 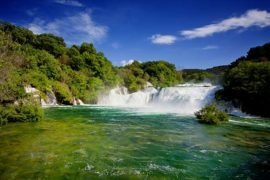 Average annual precipitation varies from more than 100 inches (2,500 millimeters) in the North Albanian Alps to less than 30 inches along much of the eastern border. Some 40 percent of the annual precipitation falls in winter. The southwestern part of the country suffers from summer droughts.